Photo caption: Decked out in red and white, but not for the UW Badgers: the 1993 Stanford University women’s cross-country team included Dr. Ann Sheehy (back row, third from the right). Coach Vin Lananna (back row, second from left) was an influential mentor for Dr. Sheehy. As head of the Division of Hospital Medicine, teamwork is an everyday focus for Ann Sheehy, MD, MS. The role comes naturally, because Dr. Sheehy spent her high school and college undergraduate years as a competitive runner. After graduating from Middleton High School, she competed on the Stanford University cross country and track teams. "College athletics was such an important part of my life as an undergrad," she said. 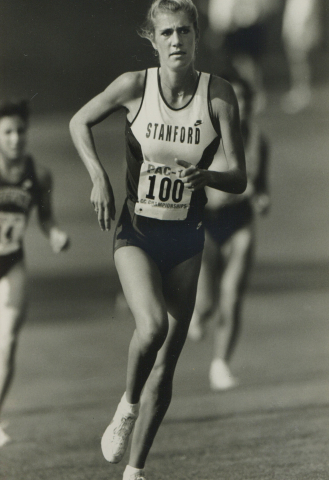 Her collegiate experience included serving as team captain during her junior and senior years, competing in a 1993 Pacific 10 cross country team championship (pictured at left), and competing in two NCAA cross country championships (Stanford did not win the NCAA championships). “I'll never forget that Pac 10 moment,” she said. “The whole starting line was lined with people,” she recalled - an unusual sight for cross country, which doesn’t attract as much media attention as the “big three” of football, basketball, and baseball. Stanford did win the Pac 10 championship. And Dr. Sheehy ended up with an additional life-changing experience: breaking her foot during the 1993 NCAA championship race at Lehigh University. “I went through the medical system as a result of the stress fracture, and it sparked my interest in becoming a physician,” she said. Dr. Sheehy is now in a position to give back to the collegiate athletics system as a member of the University of Wisconsin-Madison Athletic Board, which advises the Athletic Department and Chancellor and interacts with the Faculty Senate and University Committee regarding athletic activities and policies. She follows in the footsteps of other Department of Medicine faculty who have served on the athletic board, including Patrick McBride, MD, MPH, emeritus professor, Cardiovascular Medicine, and Bruce Klein, MD, professor, Infectious Disease and Department of Pediatrics. Laurel Rice, MD, chair, Department of Obstetrics and Gynecology, is a past president of the board. Betsy Trowbridge, MD, interim chair, Department of Medicine, serves on a different sports-related board: she is a permanent member of the Board of Directors for the Green Bay Packers professional football team. Beginning in January 2019, Dr. Sheehy will serve as vice chair of the board and one of two faculty athletics representatives (FARs) from UW-Madison to the Big Ten and NCAA. “I’m starting to learn more about the role of FARs. One aspect is to make sure that the students' academic interests are upheld,” she said. Being a former NCAA athlete, a faculty member, and a physician allows Dr. Sheehy to occupy a unique role on the board because she can relate personally to the experiences of athletes, and she can also relate professionally to the experiences of athlete medical service providers in the Division of Sports Medicine, which 12 team physicians and 20 athletic trainers to care for members of the 23 Badgers sports teams. Her medical expertise was called upon for a special report commissioned by UW Director of Athletics Barry Alvarez in February 2018 to review the university's Department of Intercollegiate Athletics' health and safety-related policies and procedures. The report yielded numerous recommendations about ways to enhance safety aspects of physical environments in which student-athletes and staff operate, ways to improve health care - including mental health - of student-athletes, and improvements to incident communication and reporting. "UW wants to be a national leader, making sure that collegiate sports experiences are safe for the athletes, and even extending a health- and safety-conscious mindset to the coaches, staff and fans," said Dr. Sheehy. Leading the hospitalist program at UW involve skills that are directly transferrable to serving on the board, said Dr. Sheehy. “As a health care team, we have really high expectations for each other and for ourselves, and we want an environment where we are helping people achieve their goals. That's very similar to athletics. People are all there to help others achieve excellence,” she said. Her experience as a runner also shaped her views on leadership, due to the role model that Stanford cross country and track coach Vin Lananna set. When she was injured, he could easily have focused his attention solely on team members who would be competing that season. Instead, he called her daily to check in on her progress while he was recruiting on the East Coast, demonstrating that he believed in the long-term potential of team members even when they were unable to race. Leading efforts to work together toward a common goal remains a professional passion of Dr. Sheehy. Lananna’s philosophy continues to resonate with her. “You can have very high expectations, but always have the backs of your people,” she said.